Western blot analysis of extracts from 293T cells, transfected with 100 nM SignalSilence® Control siRNA (Unconjugated) #6568 (-) or SignalSilence® Fyn siRNA I (+), using Fyn Antibody #4023 (upper) or β-Actin (D6A8) Rabbit mAb #8457 (lower). 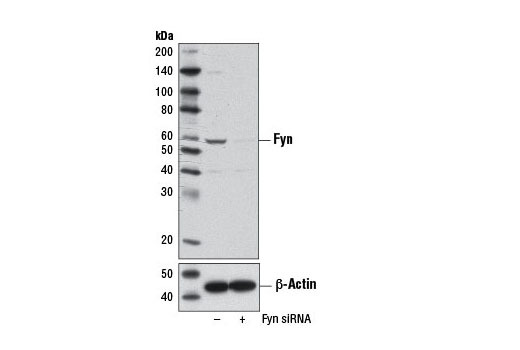 The Fyn Antibody confirms silencing of Fyn expression, while the β-Actin (D6A8) Rabbit mAb is used as a loading control. CST recommends transfection with 100 nM SignalSilence® Fyn siRNA I 48 to 72 hours prior to cell lysis. For transfection procedure, follow protocol provided by the transfection reagent manufacturer. Please feel free to contact CST with any questions on use. SignalSilence® Fyn siRNA I from Cell Signaling Technology (CST) allows the researcher to specifically inhibit Fyn expression using RNA interference, a method whereby gene expression can be selectively silenced through the delivery of double stranded RNA molecules into the cell. All SignalSilence® siRNA products from CST are rigorously tested in-house and have been shown to reduce target protein expression by western analysis. Fyn is a 59 kDa member of the Src family of tyrosine kinases. The carboxy terminus of Fyn shares extensive amino acid sequence homology with Src but is very different within the amino-terminal 81 amino acid residues. The Fyn protein is synthesized and N-myristoylated on cytosolic polysomes and then rapidly targeted to the plasma membrane, where it is palmitoylated (3). The corresponding sequences surrounding Tyr416 and Tyr527 of Src are conserved in Fyn and thus may be similarly regulated by phosphorylation. Dually acetylated Fyn clusters in caveolae-like membrane microdomains can interact with a variety of other signaling molecules. Fyn's biological functions are diverse and include signaling via the T cell receptor, regulation of brain function, and adhesion-mediated signaling (4, 5). Alteration of the levels of Fyn in appropriate target tissues may lead to better treatments for some related diseases. Resh, M.D. (1998) Int J Biochem Cell Biol 30, 1159-62. Nel, A.E. (2002) J Allergy Clin Immunol 109, 758-70. Fukai, I. et al. (2000) Eur J Immunol 30, 3507-15.